To fully live as a human, Lydia has to catch up on years of school work. At the same time, the dragon Council insists she must become their queen but without Colin. To pacify the dragons, Lydia agrees to visit for a while to reconnect with their style of life. But secretly she hires a tutor because she’s not ready to give up her dreams yet. Colin worries if he’s ready to truly love a dragon. Will he, as a human, be good enough to live in the kind of relationship required by Lydia’s bonding? Or is he bound to hurt her some day? Although Harm takes good care of Blackfeather, his biological father, he avoids talking to him. How in the world should he cope with Blackfeather’s years of lying? Also there’s Nicole, who slowly but inevitably steals his heart, even though she refuses to believe in dragons or magic. And Mordekay too hasn’t given up on his plans yet. He only adapted them to the new situation. Now freedom and survival of a whole species are in danger. Will the friends be able to stop him permanently without forcing Lydia to accept the crown and give up her love? 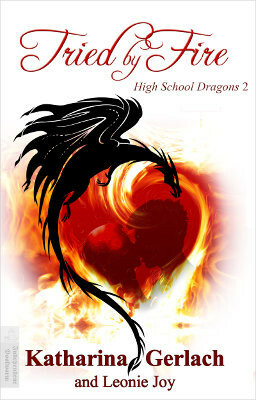 I developed this fantasy romance series with one of my children, aged 15. We deliberately targeted the idea and its execution at young-ish teens (and those who are still that age at heart). It is planned as a trilogy (no endless series for me, thank you) and will feature a different couple’s love problems in each volume while simultaneously adding to Lydia’s journey as a potential queen. We both sincerely hope you’ll like these stories.